Hillary Clinton makes a good point on healthcare. Bernie Sanders has some very popular ideas when it comes to health coverage in this country. A lot of people on the left would like to see a “Medicare for all” where people’s taxes would pay for everyone to be covered regardless of income. This would eliminate the profit motive that many feel keep millions of Americans from becoming insured. I am not opposed to this idea in principle. I have also seen how the insurance companies have harmed individuals with their unethical business practices. Moving to the system that Senator Sanders is suggesting would help to eliminate that as well. Hillary Clinton would rather us take a different approach to get universal coverage, in part because of the hurdles that would have to be cleared to reach Sanders goal vs hers. Back in President Obama’s first term the passage of Obamacare was a major fight. Part of that fight included giving up the “public option” in HR 3200 that would have allowed people to buy into a public health plan (like Medicare) on a sliding scale based on their ability to pay. The mechanisms for this were labelled “death panels” and HR 3200 was poisoned for the Senate version which sought universal coverage though more of a patchwork of Medicaid and subsidies. Fighting that fight was difficult and could only be done because for a brief period of time the Democrats had 60 votes in the Senate. The GOP could not stop the ultimate bill from being passed. The end result is we have an infrastructure in place that can handle the specifics of the Affordable Care Act. Can we afford to tear down that infrastructure and build a new one meant to handle what would be needed to implement the Sanders plan? Is it even mathematically possible for his plan to pass at all? The Democrats would need major swings in both houses, something that is exceedingly difficult in the House because of gerrymandering. This is not to say that a hard fight is not one worth fighting. However, it is about keeping our feet grounded in reality while we advocate for the issues and candidates we support. It is unrealistic to believe that a President Sanders would be able to implement Medicare for all in his first term and he would likely be required to propose amendments to the Affordable Care Act to make any improvements to the law. Of course, this is the primary season and politicians say what their ideals are now and then temper their campaigning to be closer to reality when the general election rolls around. Yesterday was Earth Day. To celebrate it I had shared a picture on my facebook wall saying “Happy Libertarian Earth Day” with a picture of a sunken ship and pollution everywhere. This caused a big debate that I will discuss here. On many issues I do believe Libertarians have it right (mostly because they agree with liberals on those issues). However, in some areas their line of reasoning is flawed and even damaging. Can the invisible hand effectively stop pollution? Does the non aggression principal allow for government regulation? I will be going into these issues in the first half of the hour. In the second half of the hour I will be discussing King V Burwell. Arguments were made back in March and the Supreme Court will be making a decision. I will have on as a guest Todd Haley, an individual who was able to get affordable health coverage under the ACA and whose case was brought up by Harvard Law School Center for Health Law and Public Policy. Mr. Haley would lose affordable coverage and would be adversely effected by a ruling against subsidies on exchanges that are federally run. I will also discuss the ridiculous nature of the arguments made against these subsidies. 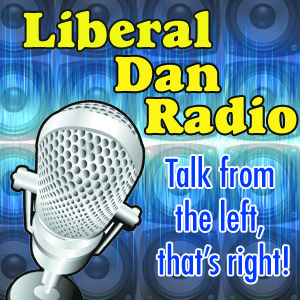 Those topics, headlines, tweet of the week, and more on Liberal Dan Radio: Talk From The Left, That’s Right at 8pm Central on Blog Talk Radio. The horrible ruling by the Supreme Court came down pertaining to Hobby Lobby and the mandate for employer based coverage to provide oral contraception. I will go into why this ruling was terrible. (Check out liberaldan.com and @liberaldanradio on Twitter to see some of my initial criticisms). Then, in the second half hour of the show, I will have on Niki Papazoglakis, founder of Freagle, the virtual town square. We will discuss why she started this venture, what her plans for it are, and how you can help get it off the ground. Those stories, headlines, tweet of the week, and more Wednesday and 8pm Central on Liberal Dan Radio: Talk From The Left, That’s Right.